Apple appears to have chosen this week to revisit its pricing strategy around the world as the company lowered overseas prices for its Mac mini desktop, iMac all-in-one, and Apple TV streaming device by as much as $80. 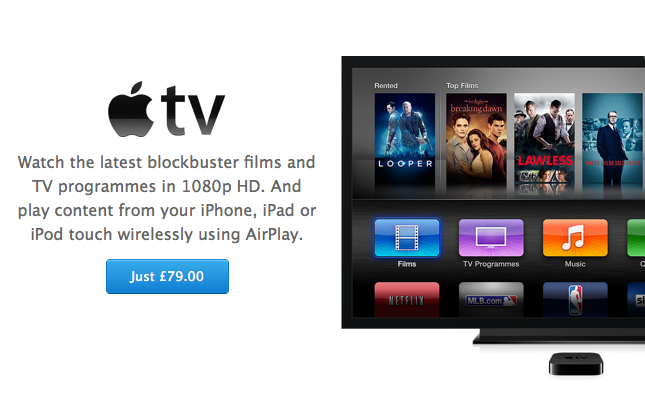 Consumers in the U.K. can now purchase an Apple TV for just £79 ($134), a £20 ($34) drop from its previous £99 ($168) price point. The cost of standard-model iMacs has been cut by between £100 ($169) and £200 ($339), depending on the configuration, while the top-end consumer Mac mini has been made £20 more affordable. On the continent, the Apple TV shed €10 ($14), bringing it to a cosmetic —though not financial —match with its American cousin. The Mac mini fell by as much as €60 ($81) in the mainland, depending on the country, though the iMac did not receive similar cuts. It is unclear if the adjustments are part of a more aggressive pricing strategy or simply the results of currency fluctuation. The moves follow Wednesday's introduction of a new, more affordable iMac that many believe is designed to help Apple compete with lower-cost, Windows-based all-in-one PCs. The new model comes with a 1.4 gigahertz Intel Core i5 processor, 8 gigabytes of RAM, and a 500 gigabyte hard disk in its standard configurations.